Five countries, five bloggers, five educational pathways. In this blog, young people from Iraq, Kenya, Russia, Germany and Argentina discuss the state of education in their home countries as well as their own experiences in the system. They come from varying cultures, religions and classes. It was not always easy for the bloggers to make their way through school, but they agree on one thing: Promoting access to education is important. Please join the discussion – comments are welcome, including about your own experiences with learning. Melting ice caps, catastrophic hurricanes, floods and drought plunging entire regions into a water crisis. These are the drastic images often associated with climate change. But what’s actually being done on the ground to halt global warming? 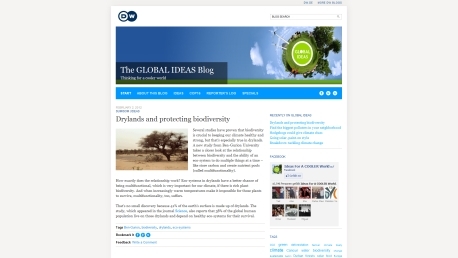 The GLOBAL IDEAS Blog features imaginative approaches to climate protection beyond our TV-reports, provides a platform for discussion as well as inside commentary from our editors and reporters. There are so many amazing people and clever ideas out there, they all need to be seen. Whether they are campaigning for free press in Zimbabwe, helping provide clean water in India, or offering free music lessons to underprivileged kids in the UK, young people all over the world are making a difference. 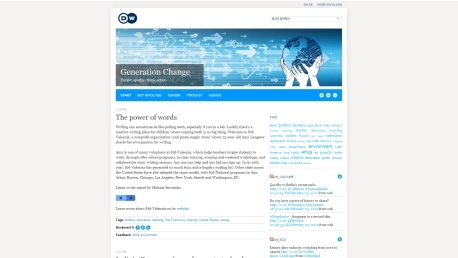 Deutsche Welle’s weekly podcast series Generation Change shares their stories. Куда движется Россия? Можно ли решить насущные проблемы страны в условиях нынешней политической системы? Что означает на практике партнерство России и Европы в деле модернизации? Способна ли Европа вообще оказать реальную поддержку России на фоне экономического кризиса, охватившего ряд стран ЕС? Эти и другие вопросы немецкая медиакомпания Deutsche Welle регулярно задает представителям молодого поколения России. На страницах этого блога российская молодежь делится своим взглядом на важные события в России и в Европе. 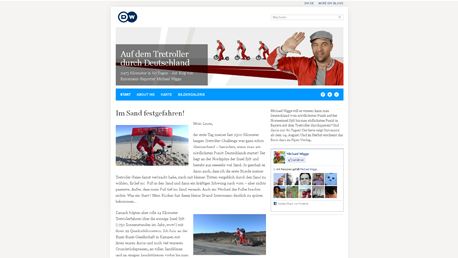 Fünf Länder, fünf Blogger, fünf Bildungswege. In diesem Blog diskutieren fünf junge Leute aus Irak, Kenia, Russland, Deutschland und Argentinien über Bildungschancen in ihren Heimatländern und über ihre eigenen Bildungswege. Sie kommen aus verschiedenen Kulturen, Religionen und sozialen Verhältnissen. Ihre Bildungswege waren nicht immer einfach, aber alle sind sich einig: Das Engagement für Chancengleichheit in der Bildung lohnt sich. Diskutiert mit, kommentiert die Einträge. Und schildert eure eigenen Bildungserfahrungen! Euromaxx-Reporter Michael Wigge will Deutschland von Nord nach Süd auf dem Tretroller durchqueren – in nur 80 Tagen! 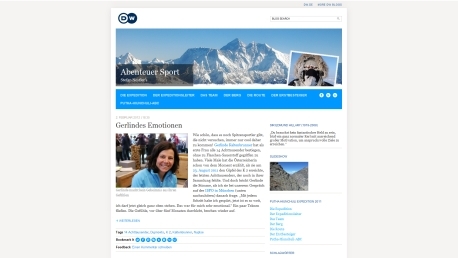 Seit Anfang April ist er unterwegs und bloggt über seine Erlebnisse. Deutsche Welle (DW) is Germany’s international broadcaster. Founded in 1953 as a traditional radio station, DW has steadily evolved into a modern digital media operation in the last two decades. DW Innovation is the moniker of two interoperable institutions under its roof: DW Research and Cooperations Projects (DW ReCo) and DW Lab. DW ReCo is a reliable and highly experienced partner for media research and innovation projects. Its expertise covers many fields at the crossroads of journalism, IT, and media science: data-driven journalism, drone journalism, immersive journalism, content personalization, content verification, distributed ledgers, human language technology – the list goes on. DW ReCo develops media use cases and dissemination concepts. It provides multimedia content and creates user interfaces, it validates and evaluates. With increasing frequency, DW ReCo also launches finished software products. DW Lab is a special place for media experiments within DW. The lab team looks for innovative ideas in digital journalism across all DW departments – and helps to bring them to fruition: Candidates are chosen via applications and pitches, and are eventually invited to the lab. This is where they meet a carefully selected, interdisciplinary team. Over the course of two weeks, the “labsters” collaboratively create a working prototype – which may subsequently become a part of DW’s programming or infrastructure. DW ReCo and DW Lab frequently cooperate and switch staff. Wohin steuert Russland? Was muss unternommen werden, um das Land zu modernisieren? Kann man im Rahmen des aktuellen politischen Systems die dringendsten Probleme des Landes lösen? Was bedeutet die Modernisierungspartnerschaft zwischen Russland und der EU in der Praxis? Und kann die EU Russland überhaupt unterstützen, während mehrere europäische Staaten in einer tiefen Schuldenkrise stecken? Zu diesen Themen befragt die Deutsche Welle die Teilnehmer des Projektes “Generation-2012” – 12 junge Menschen aus Russland. In diesem Videoblog präsentieren sie ihren Blick auf wichtige Ereignisse in Russland und Europa. 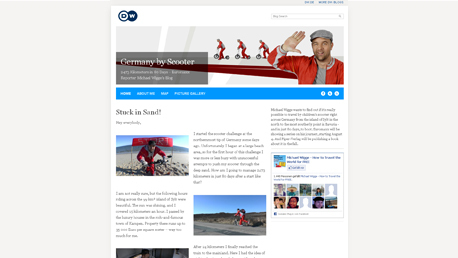 Sportreporter Stefan Nestler schreibt in seinem Blog über Expeditionen und Grenzerfahrungen. Es geht ihm um Menschen, die in die Natur hinausziehen, um ans Limit und möglicherweise sogar darüber hinaus zu gehen. Die bevorzugte Spielwiese der Abenteurer, um die es hier geht (Stefan inklusive), sind die hohen und steilen Berge der Welt. Euromaxx reporter Michael Wigge is trying to traverse Germany from north to south on a children’s scooter. He’s been on the road since the start of April and is blogging his experiences. 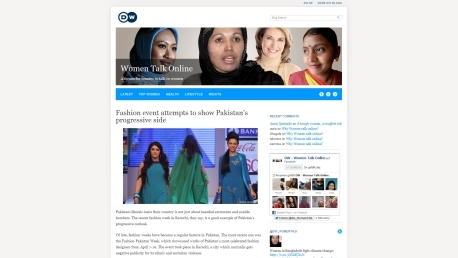 Women Talk Online is a project by the DW South and Southeast Asia service. The blog is an attempt to lend a voice to women in Asia, Europe and around the world and to foster discussion on women’s issues. We encourage young bloggers who want to write for us. If you’re interested, please send us your blog entry of about 300-500 words on any theme of relevance to women. You can email your entry to womentalk@dw.com or send us a message on our Facebook page, DW- Womentalkonline. Please include your details and contacts in your email. Icebergs, glaciers, snow-white foxes – the beauty of the polar regions features large on the Ice Blog. But what’s happening to all this in a changing climate? And how does the melting of the polar ice in turn affect the rest of the globe? 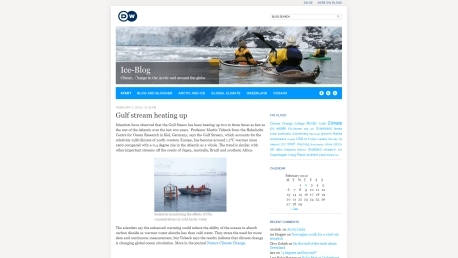 DW environment journalist Irene Quaile documents her icy travels – and comments in between on climate-related news and views across the planet.